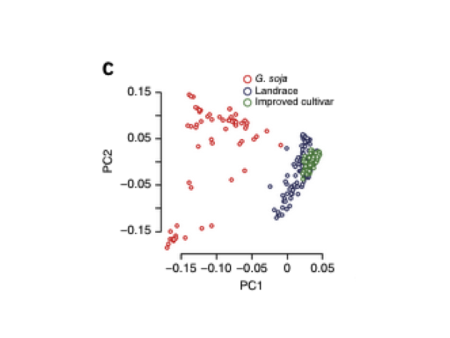 I think this really shows very compellingly how the genetic diversity space shrinks and shifts as you move from wild soya to modern varieties. You don’t even really need to know that the axes are principal component scores or indeed how diversity was measured. But is this kind of diagram common out there? I can’t remember seeing anything quite this clear, and some rapid googling drew a blank too. Well, perhaps I read the wrong journals. So here’s a question for you: what’s your favourite illustration of the domestication bottleneck, using real data? If we get a decent number of examples, I’ll try to put them all together in a post, and maybe even organize a vote. Modern wheat breeders will tell you their wheats have become more genetically diverse after an initial bottleneck of the dwarfing of wheat in 1960’s through breeding in of transgene DNA (e.g. from rye and emmer) and novel wheat line DNA from genebank accessions (e.g. ), however this just referring to the diversity within a single grain. Spatial genetic diversity refers to diversity within a field and between fields and here picture is very different, as M. Smale of CIMMYT put it “today’s breakthrough in achieving genetic diversity is tomorrow’s potential source of narrowing precisely because such breakthroughs often produce wheat cultivars that many farmers adopt.” See also. Better URL for the famously disease resistant USDA-ARS line PI 178383 collected in Turkey at in 1948 by Jack Harlan. Is that village still using its own wheat or CIMMYT lines? PI178383 is a landrace. Has anything this valuable to plant breeders ever come out of a wild relative? Dave: are you referring just to wheat or making a more general statement about use of PGR? If it’s a general statement (which I hope not) then I have to disagree very strongly – just see the many examples from potato and rice, two crops with which I do have some familiarity. Mike: It was more general. Has any such a wide range of characters useful to plant breeders come out of any single sample of a crop wild relative? Mike: I’ve just thought about the importance of allopolyploidy (e.g the origin of bread wheat) – where lots of characters from a wild relative can be added at the same time. This must apply to potatoes?? Lots of wild potatoes used in breeding. Solanum demissum for late blight resistance, for example. Okay, superseded by better sources of resistance but was once an important resistance sources. Other good potato examples as well. What about Oryza nivara accession for grassy stunt virus resistance. Was it IR36, 64 or 72 that became so successful — grown over millions of hectares. The ‘commercial value’ of that accession alone could have paid — and continue to pay — for all rice germplasm conservation. Wild rices being used quite extensively now for many different characters. Or have I missed something in the point you were making? Mike – I was more interested in a range of useful characters coming from a single sample of CWR as compared to the single sample PI178383 (a landrace). 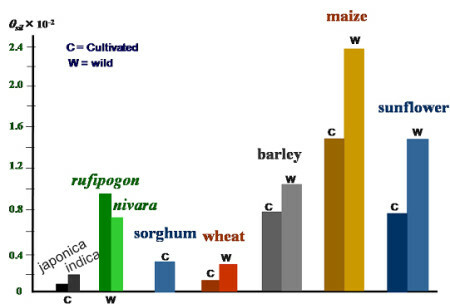 I think for decades various rust resistances in bread wheat have come (exclusively??) from a range of wild species but no single wild species has provided the lot. It would be interesting if PI178383 had accumulated resistances through its ancestry in contact with other land races and wild species above and beyond what any single wild wheat relative had managed. If so, that would be an excellent underpinning of on-farm conservation of (enriched) landraces. Luigi, you may want to add this beauty too.